Saturday, we bid farewell to T.J. with much advice about the climbs and descents we faced. The climb up from Rico to Lizard Head Pass on Highway 145 was spectacular. The mountains seemed to multiply around us and it was hard to keep our attention focussed on the road. Near the top of the pass we were struck by the sight of El Diente (the Tooth) off to the left. 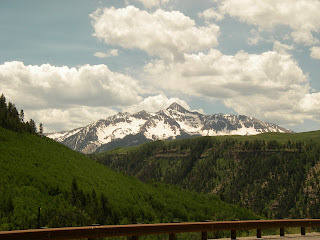 On the right the whole of the San Juan Range stood before us, towering and covered in snow. During our descent, Dave stopped to talk to some fellow tourists and was passed by T.J. and his brother who had ridden over the Pass before us and were on their way back to Rico. A final farewell and thanks was given. The descent from Lizard Head took us through alpine valleys filled with avalanche chutes, into red rock cliffs carved by the San Miguel River and finally to the junction of Highway 62 at Placerville. Our final climb over the Dallas Divide took us past North Pole Peak in the Mt. Sneffels Wilderness. As we crested the Divide, the Continental Divide stretched out in front of us, then we descended for 11 glorious miles into Ridgway. Saturday ended with a total of 2900 ft. of climbing and 67 miles. 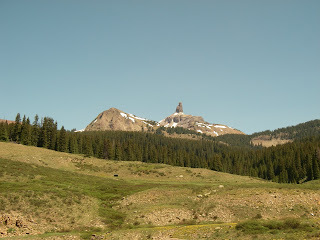 We camped at Dutch Creek Campground on US 550. An easy 20 miles brought us to Montrose today, where we rejoin US 50 to continue eastward. Beautiful country. With all the lakes and rivers, did you take a fishing pole? 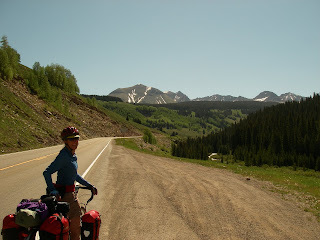 And did the 10,222' elevation of Lizard Head Pass affect you? Gasp, gasp. Hi Diana, no fishing pole! But I have wished I had one. The waters are at near flood as Colorado is experiencing snow runoff of 130% this year. The elevation hasn't really affected us as we have been quite high most of the way. The lowest we have been since leaving California is 3000 ft at Lake Powell.